Buttercream Wedding Cake Essex at The Old Parish Rooms, Rayleigh. 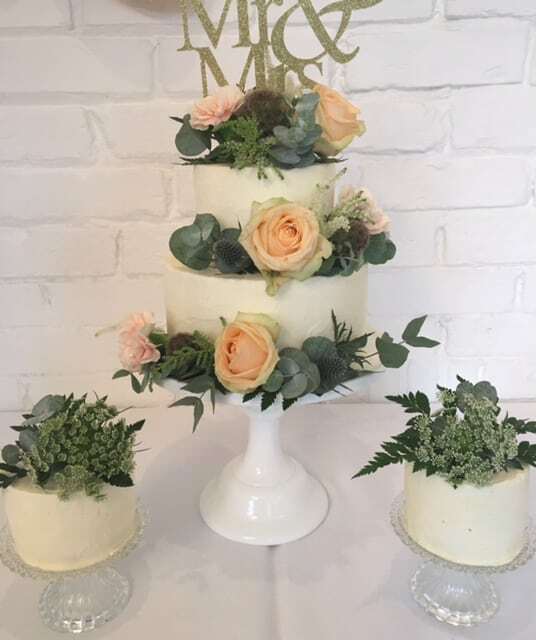 We were honoured to be the chosen Essex wedding cake maker to provide a cute 2 tier buttercream wedding cake for The Old Parish Rooms Venue Open Day (www.theoldparishrooms.com) on Sunday 18th September. We decided to display the wedding cake on one of our gorgeous American Milk Glass stands (which you can hire from us!) and we also decided to supply 2 matching mini buttercream cakes to display either side of the main cake. I decorated the cakes with some gorgeous flowers supplied by The Flower Arranger (www.theflowerarranger.co.uk) who also supplied the table centres for the tables. I can’t tell you how wonderful a venue The Old Parish rooms is! If you’re looking for a small, intimate venue in the Essex area (although it can accomodate 80 people for a seated meal) then look no further. It truly is such a pretty, unique venue and what’s even better is the Holy Trinity Church, Rayleigh is tucked just behind, so perfect if you’re having a church wedding but The Old Parish Rooms is also now licensed to perform civil ceremonies too, so you have a great choice. We’re supplying a naked wedding cake for a wedding party in November and I can’t wait!